Nov'r. 9— James Ryan, Co. K, 33d New York. 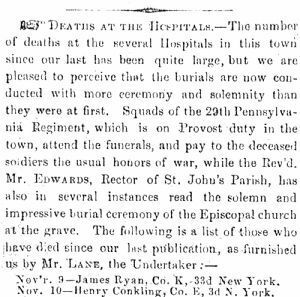 Nov. 10— Henry Conkling, Co. E, 3d N. York. Wm. Beecher, Co. D, 96th Pa.
Nov. 11—Jesey Hoyt, Co. A, 27th N. York. Nov. 12 Jas T. Bourland, Co. D, 137th Pa.
Nov. 13—-Urban Sears, Co. H, 37th Mass. Geo. Sprague, Co. K, 5th Vermont. Isaac M. Spink, Co. F, 322d N. York. Chas. Williamson, Co. K, 2d N. Jersey. C. Lambero Fais, Co. B, 139th Pa.
E. R. Walker, Batt’y D, 2d U. S. Art’y. Daniel Rockwell Co. K, 49th N. Y.
Henry Barrell, Co. B, 119th Pa.
Nov. 15 — John W. Campbell, Co. G, 49th N Y.
Nov. 16 — Sylvester R. Briggs, Co C, 4th Vt.
Jacob Fannerburg, Co. A, 33d N. Y.
Jas. H. Teuver, Co. A, 49th Pa.
Thos. Boyle, Co. K, 33d N. York. Shall disturb your ears no more!